Are you dreaming of spending a vacation in a summery paradise filled with blue skies, turquoise waters, and fine white sand? 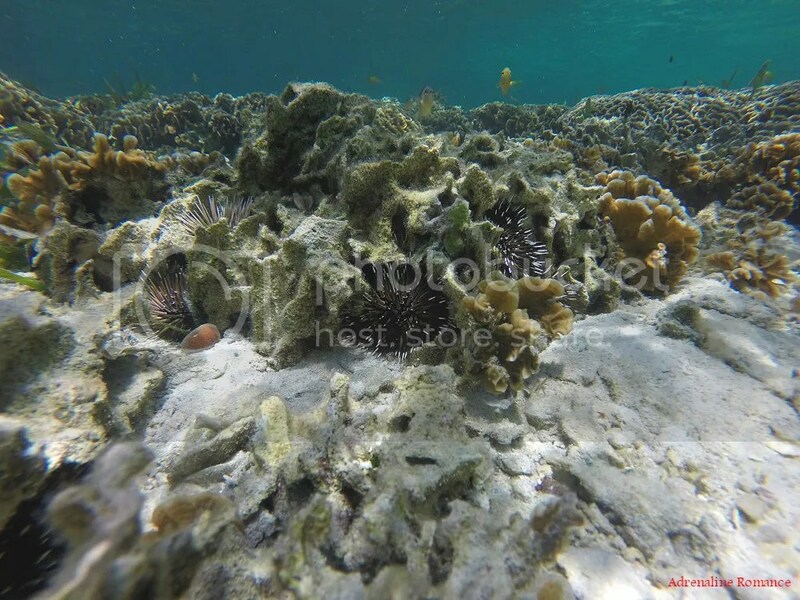 Perhaps you’re itchy to try snorkeling around a beautiful coral reef? Now, you don’t have to travel far and wide, struggle with complicated routes, or break your bank account. These idyllic paradises are located in Panglao, Bohol at the center of the Philippines. On a more personal note, Sweetie and I want to give our sweet daughter Alexa a graduation gift that is not monetary or material. Rather we want to give her a gift that constitutes knowledge, rich experiences, and an understanding of nature and culture. 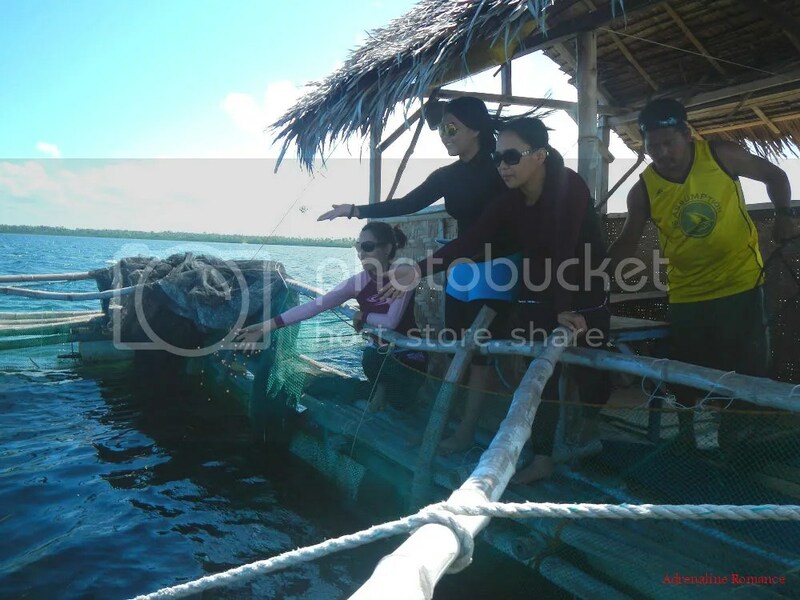 Letting her experience a trip in Bohol was the way to go. 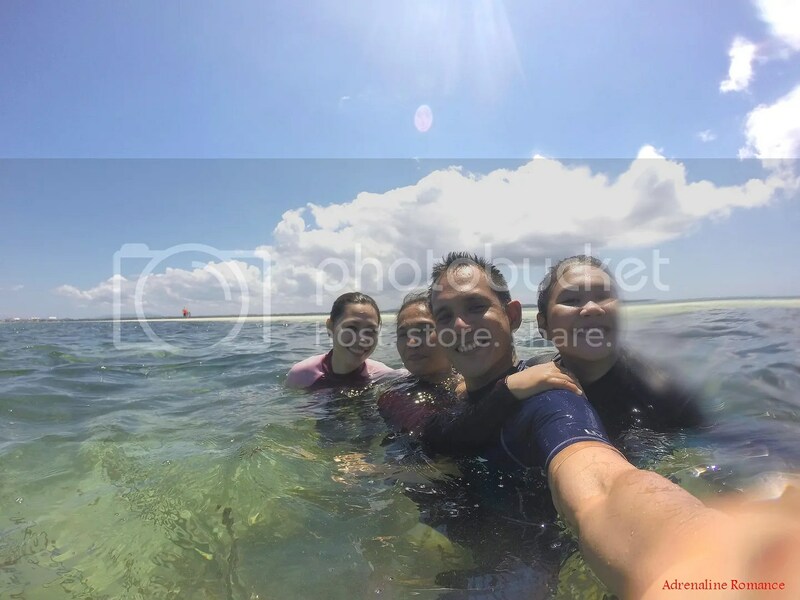 We were also very happy that our close family member and friend Aivy tagged along. We took an 8-hour, slow and smooth overnight ferry ride from Cebu to Tagbilaran, Bohol. You see, the nice thing about taking a good ole’ slow ship in the Philippines is that you get to sleep in a real bed while fresh sea air blows around you. You wake up refreshed at your destination. 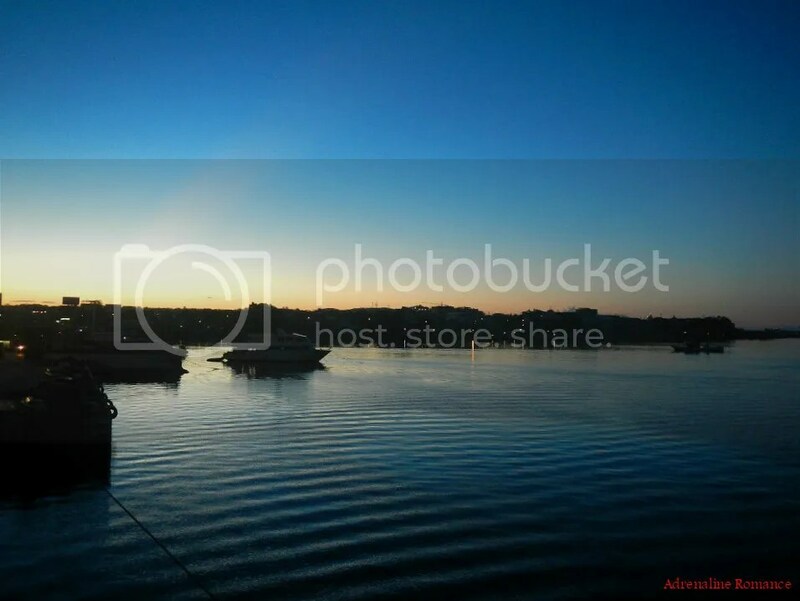 At the break of dawn, we arrived at the busy port of Tagbilaran. We had a hearty breakfast and bought our packed lunch at Tagbilaran’s McDonald’s. It was the only food establishment open at that time. Now, supposedly, we were to ride a tricycle to go to Dao Terminal to catch a regular jeepney to Panglao Island. 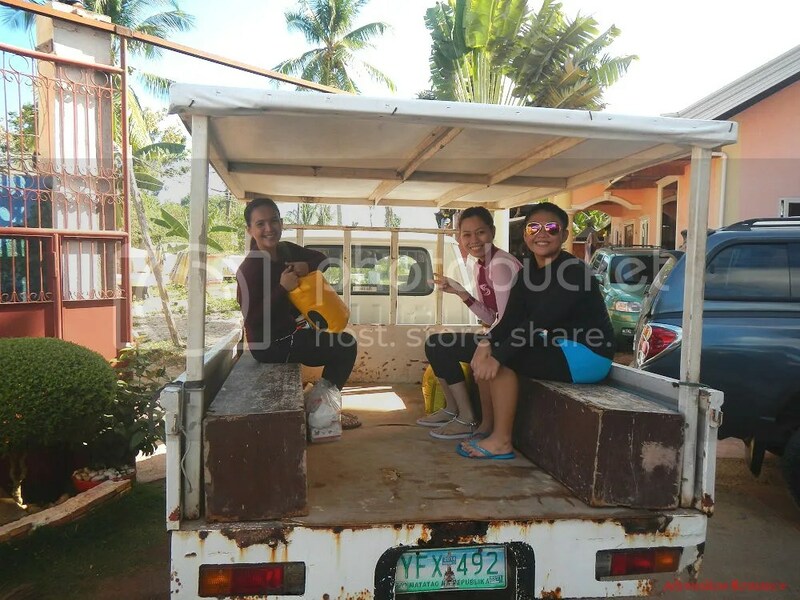 However, our friendly tricycle driver said that jeepneys to Panglao take a very long time to fill with passengers before they rumble down the road; at times, filling one takes two to three hours. That will definitely put us off our itinerary. As an alternative, he offered to drive us all the way to Panglao at a very reasonable price. So, off we went! We arrived at our accommodation, Coco Mango’s Place, quite early, around 7AM. After checking in and changing to our rash guards, we were ready to start our exciting island hopping adventure. Anne, the owner of the bed-and-breakfast where we stayed in, has already arranged the boatman to take us to the islands around Panglao. Oh, look! They provided us a free shuttle! 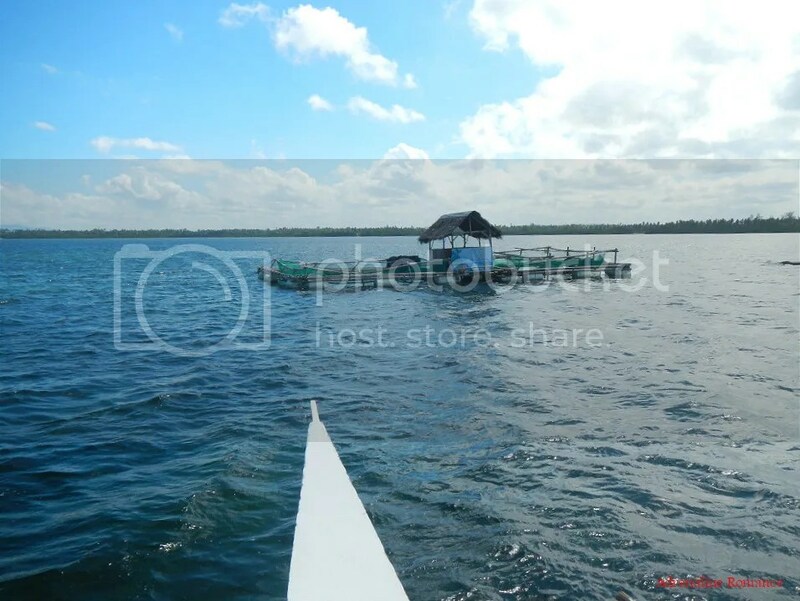 In a few short minutes, we arrived at the next barangay to meet our boatman. After exchanging pleasantries and agreeing to a minor change in our route, we started walking down a small pathway towards a sandy cove. On the way, we saw interesting snippets of quiet country life such as this mother-and-daughter team. They were laying down freshly gutted fish to dry out in the sun. Lightly fried, salty dried fish is a common staple here in the Philippines. It is usually eaten with hot rice and dipped in vinegar with chilies. Since it was still low tide, we need to trek across this nice sand flat to get to our boat. It is the home of thousands of mollusks and crabs that shorebirds prey upon. Isn’t that a nice vessel? Wooden outrigger boats are ubiquitous in the Philippines and are amazing marine engineering feats in themselves. Their wooden hulls, which are resistant to rust, are very narrow, enabling the sleek vessel to slice through the waves. Balance is achieved through two hydro-dynamically shaped outriggers jutting out on both sides of the hull. The ingenious vessel draws very little water and floats high on the water, which makes it ideal for cruising around shallow reefs. After maneuvering the boat to deeper water, our boatman started the vessel’s noisy engine. 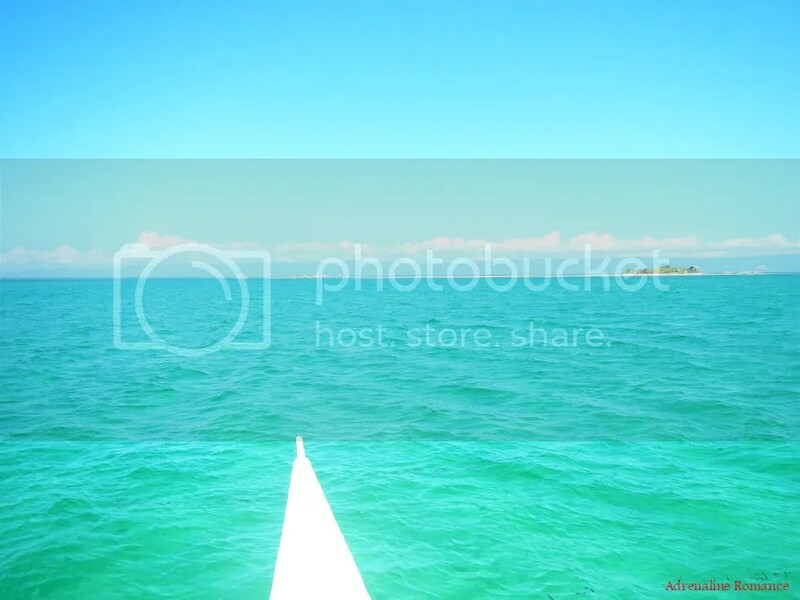 We were on our way to our first destination, and we sailed across Bohol’s lovely aquamarine waters. Spiky fish pens like these are common sight in Panglao’s waters. A large net is threaded along those numerous bamboo posts jutting out of the water. Numerous fish are then bred, grown, and nourished inside the pen. When they’re fully grown, the fish are then harvested and sold in the market. Our friendly boatman first took us to our first destination, a small fish pen that also serves as a feeding station. For us, this is a great opportunity to check out how a fish pen works. A rickety bamboo walkway allows guests to walk around the pen. At the center is small hut that serves as a shelter and a lookout for fishermen. The tough green nylon net that holds hundreds of fish was clearly visible from this point. 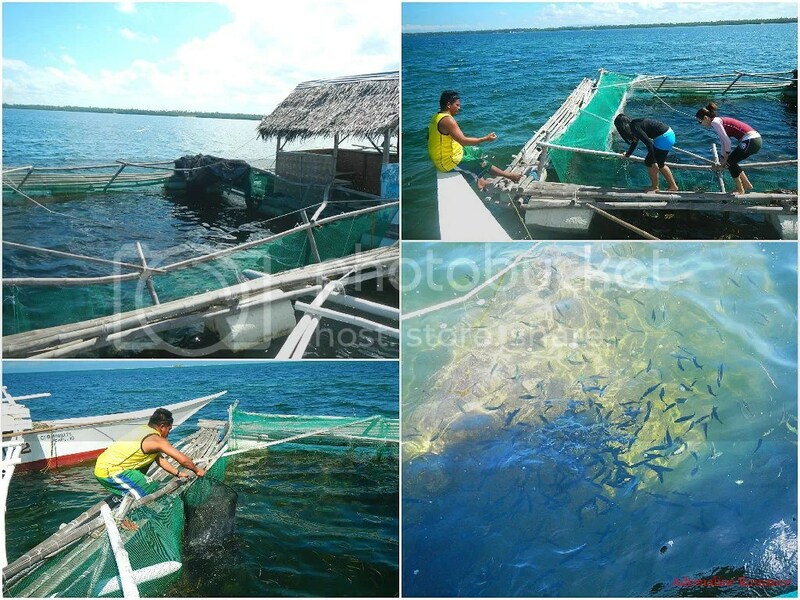 While the net imprisons the fish, it also protects them from predators. Visitors can toss fortified pellets that provide food and nutrition for the fish. Yes, there was a feeding frenzy. After half an hour of checking out each inch of the fish pen, we figured out that we’re ruining the fish’s diet. Hehehe! So, we left the fish pen and went to our next destination. The summer morning became brighter, and the sea became even lovelier. 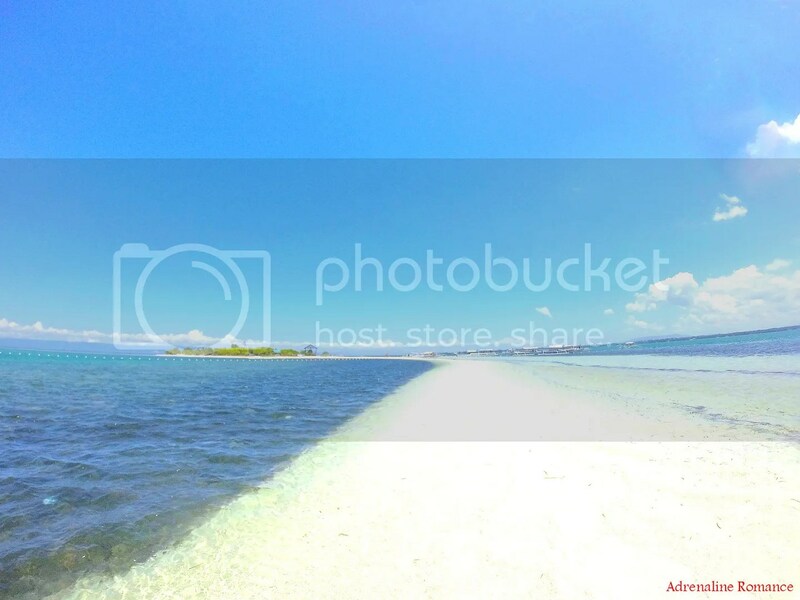 We arrived at this amazingly pristine sandbar locally known as Virgin Island or Pongtod, which lies squarely on the Panglao Reef Flat. The floating buoys are there to demarcate the swimming areas. No boats are allowed to anchor inside the buoys. In fact, they have their own parking area while waiting for their guests to go back. Welcome to the idyllic sandbar of Isola di Franceso. Yes, entrance to the island was free of charge when we visited there. We do hope it stays that way. Or if fees are implemented, we do hope they’re affordable for everyone. There were also highly visible message boards that display relevant information. Whoopee! Just check out that fine white sand and that turquoise water. Don’t you just want to bask in the sun or simply dive in? But first, let’s explore this island. As we approached it, it definitely looked like it’s more than just a sandbar. 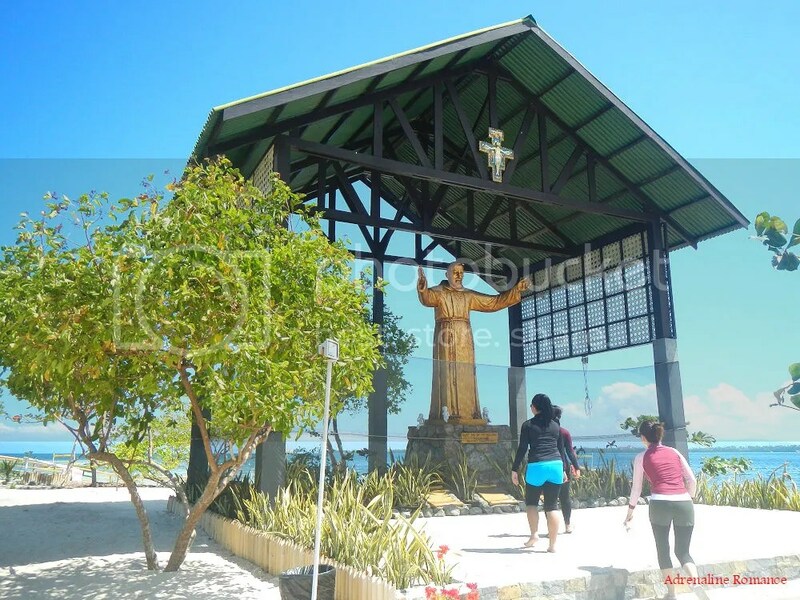 At the north part of the island is a large golden statue of the Francescan friar St. Pio, who is known to exhibit signs of stigmata. Bamboo lounge beds? Why not? If not for the garish paint, they would fit perfectly in the beach. Before enjoying the island, it is best to get acquainted with a few rules. Yes, you are not allowed to kiss! 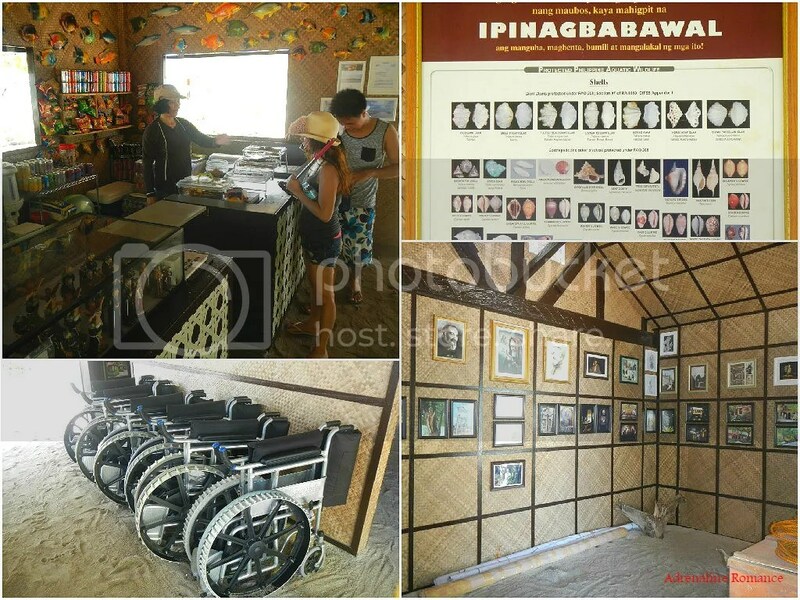 Let’s check out their mini museum and visitor’s center, which is made of native amakan, nipa, wood, and bamboo. They have a small “store” where you can get snacks, beverages, souvenirs, and trinkets. Now, there’s no price on the items! Yes, you guessed right: you don’t buy them. Instead, if you want to have something, you give a donation whether cash or in kind. There is also a mini museum filled with photos of the Francescan friars. Disabled people and the elderly who wish to go around the island are given free access to wheelchairs. Outside the mini-museum and the visitor’s center, we found a shady green grove where guests can seek refuge from the sun’s heat. Seabirds, pigeons, and doves regularly visit the grove, and they don’t seem to mind those pesky humans coming a feet or two from where they’re perching. Huge clay jars, colorful flower beds, and decorative bamboo fences adorn the grove. Religious statues of angels, cherubs, and the Holy Family are laid out all over the shady grove. We later learned that Isola di Francesco, which is owned by the Philippine Center of St. Pio of Pietrelcina, is to be made into a pilgrimage center and a place of spiritual reflection. 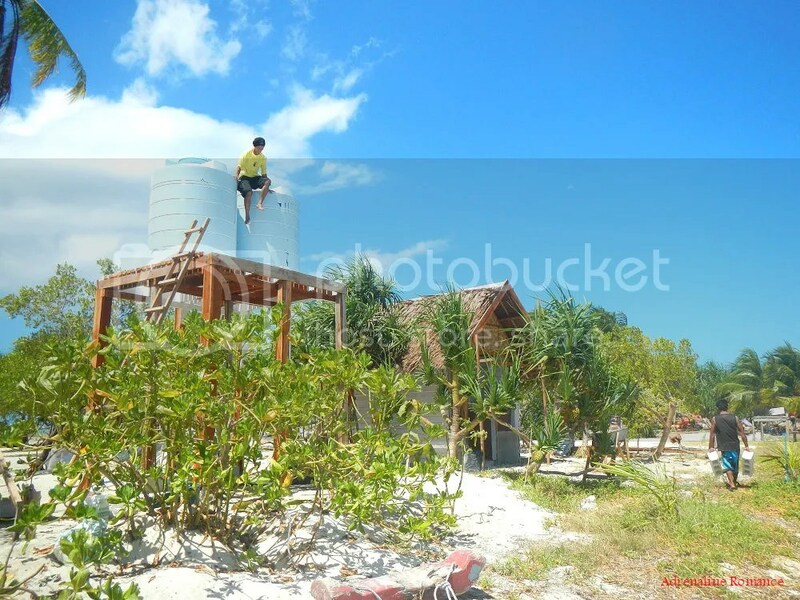 Hired local workers toil under the sun to build a chapel, a few restrooms, water tanks, and guest houses in the island. Since Isola di Francesco is cut form the mainland, it needs to be relatively self-sufficient thus the construction of a water tower. The island itself is maintained through gratuities. It was getting hotter as the morning wore on. That meant, it was time to take a dip! 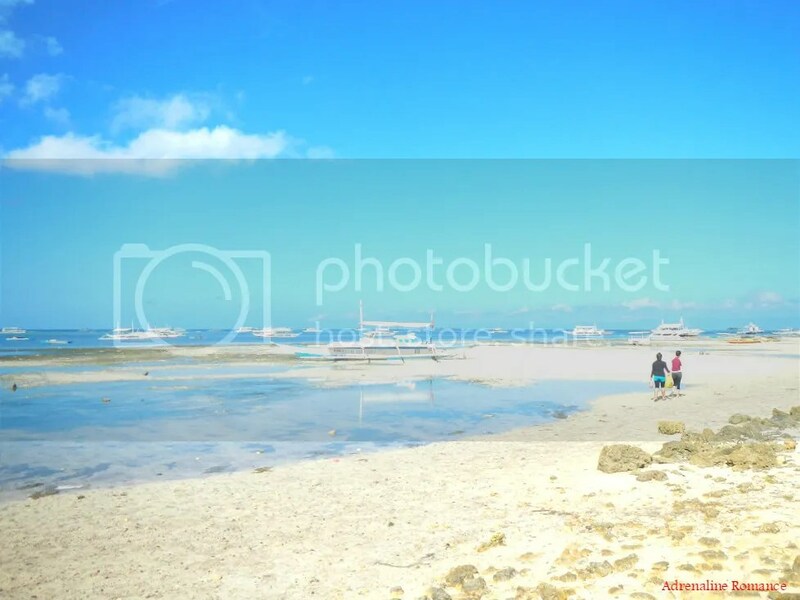 Panglao’s crystalline water was an elixir to the skin. Let’s go to the other side and check out that long, white sandbar. What a spectacular, summery sight! Certain parts of the sandbar become fully submerged during high tide. What about a selfie on the way? Hehe! Check out that dazzling aquamarine lagoon. Smile for the camera! Don’t you just want to stay all day in that clear, cool water? After spending roughly two hours in this island paradise, it was time to leave to our next destination. But Aivy and Alexa can’t seem to get enough fun! Let us share a tip: do wear a pair of good quality, UV-blocking sunglasses. The fine, powdery sand in Isola di Francesco is so white that it reflects harsh sunlight back to your eyes. 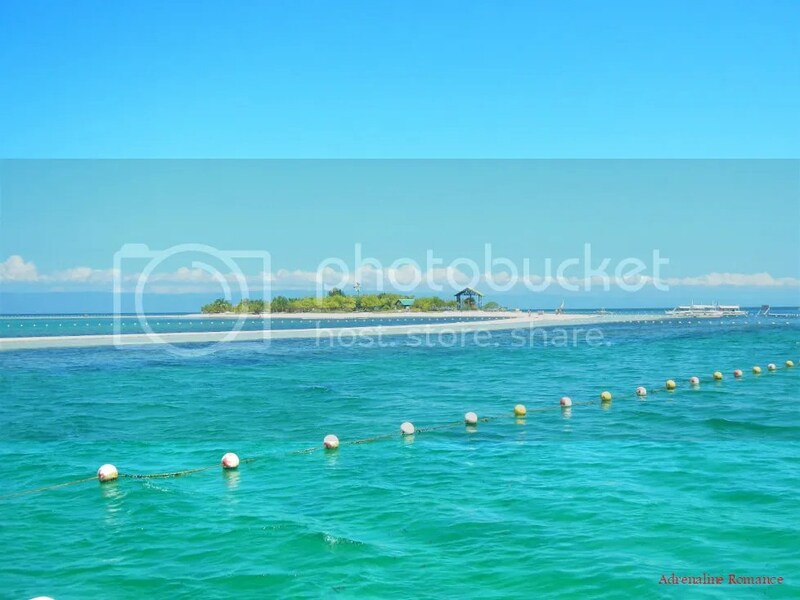 After re-boarding our boat, we sailed towards Gak-ang Island, which is a relatively new destination in Panglao. Along the way, we passed by humble fishermen who were happily harvesting the bounty of the sea. Less than half an hour later, we arrived at an uninhabited and ordinary rocky islet. Yes, this is Gak-ang Island, and except for the long line of floating buoys, nothing seemed to be particularly extraordinary. Well, the real gem of Gak-ang Island is not the island or something on the island but under the tranquil waves that lap on the island’s rocky shores. 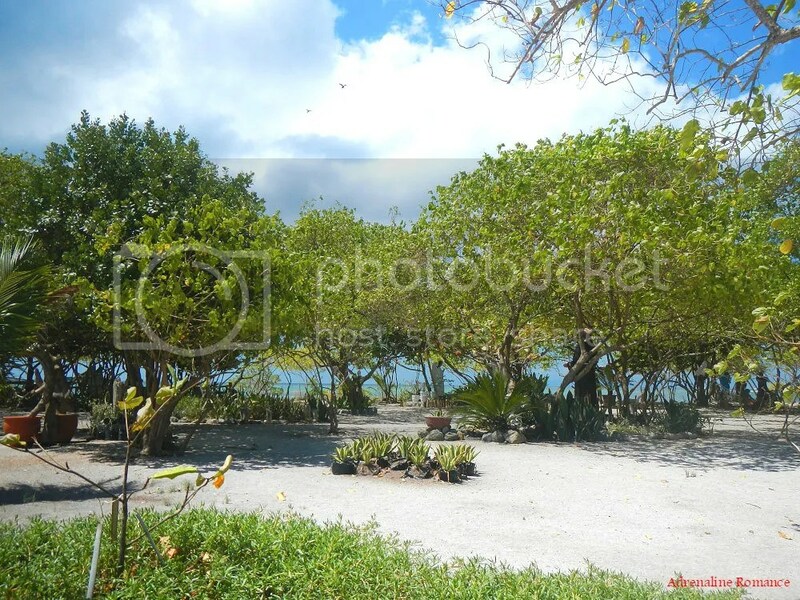 We do believe, however, that the island itself is a refuge of birds, snakes, and other reptiles. 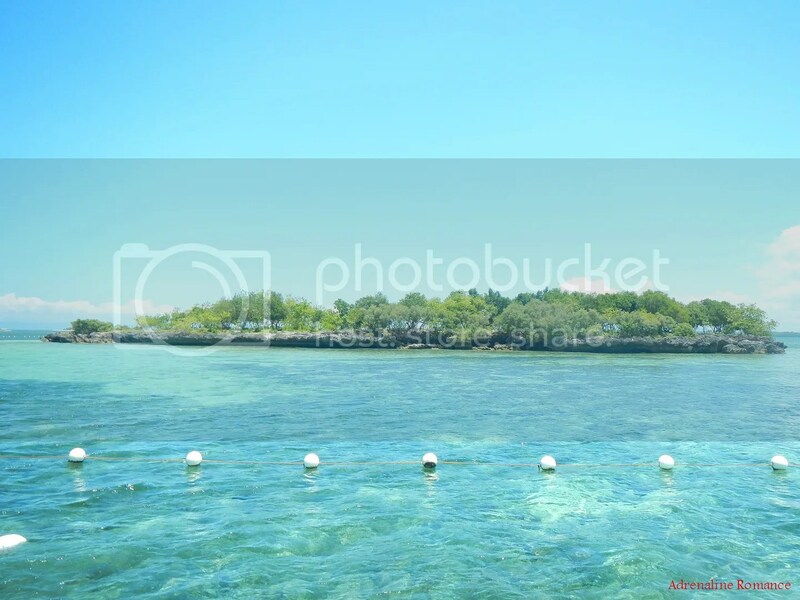 Gak-ang Island sits atop a small submerged shelf that is insanely rich with corals. Yes, it’s a new snorkeler’s haven and a locally protected area. 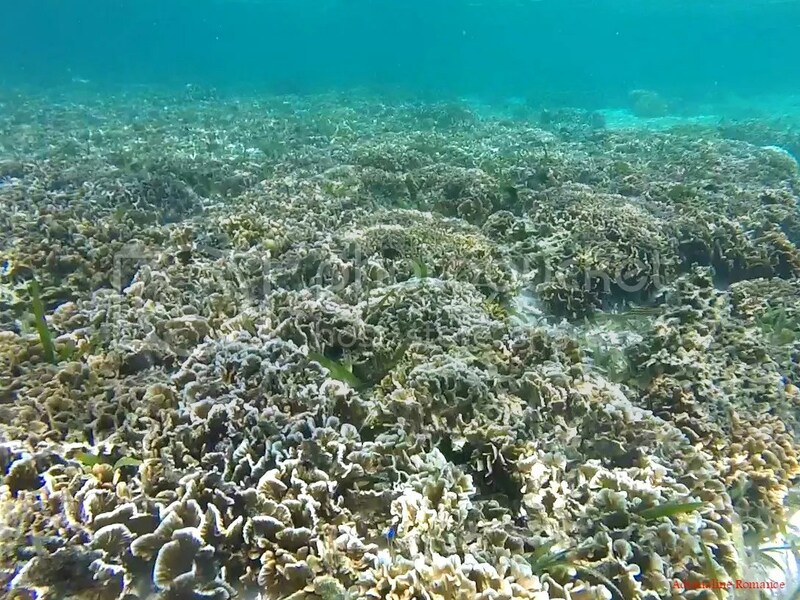 The coral formations in Gak-ang Island are unique; they form almost uniform clumps. Inside the crevices of these wafer-like corals is a wide variety of fish, mollusks, shellfish, anemones, and other creatures. But let’s talk about safety first. 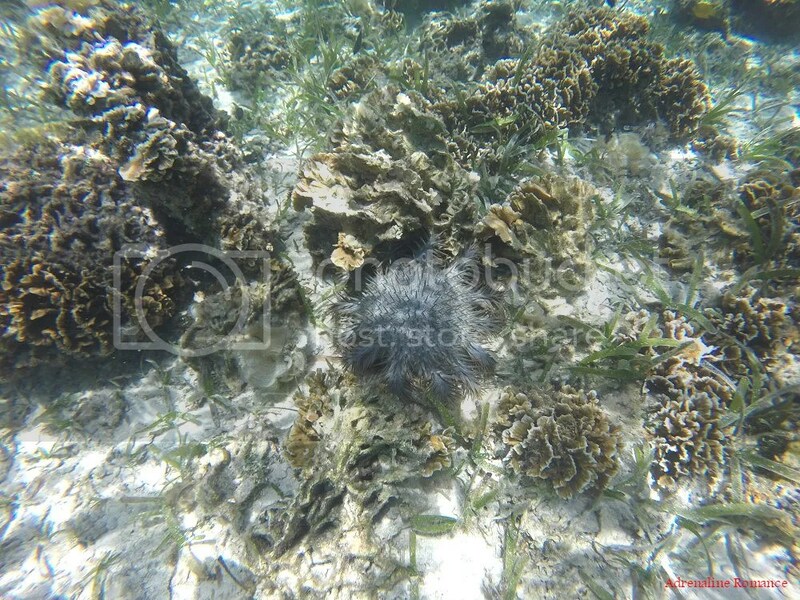 You need to be careful where you place your feet when snorkeling in Gak-ang Island because there are colonies upon colonies of black sea urchins. Those wicked spikes, which breaks easily upon contact, can easily puncture the skin of your feet. Punctures from sea urchin spikes are very, very painful. That’s why we strongly advise that you wear a life vest or, if you know how to swim, hover above the corals to avoid these urchins. Never step on the delicate corals! These small sea urchins have shorter spikes than those black ones. In other shorelines in the Philippines, kids and parents wade in the water during low tide to hunt these creatures. Their meat is quite delicious, and they can be eaten raw. Oh, hello there, Marlin and Nemo! Many of the corals have become firm attachment points for dainty sea anemones, which serve as homes for gaily-colored clownfish. A sea of stars—literally! 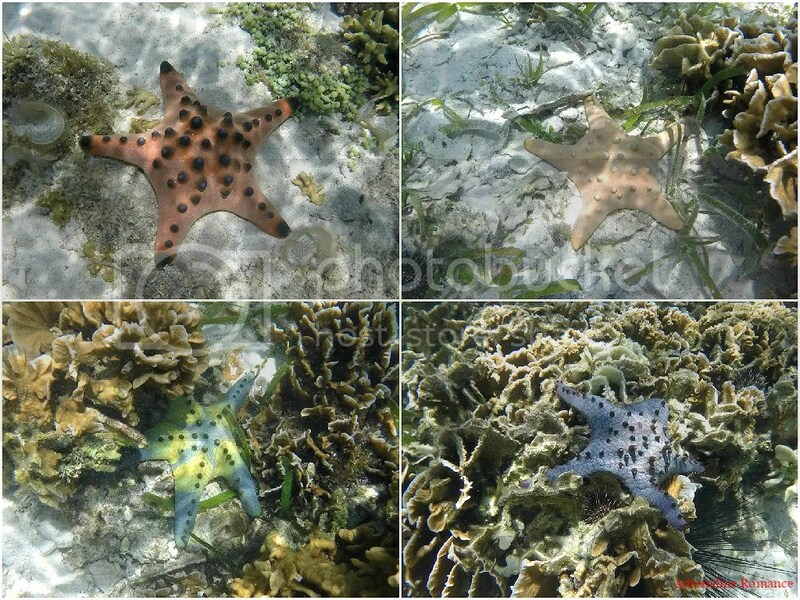 Gak-ang Island has starfish of all kinds, shapes, and colors everywhere! That blue one with the short spikes is my favorite. But not all sea stars are passive. 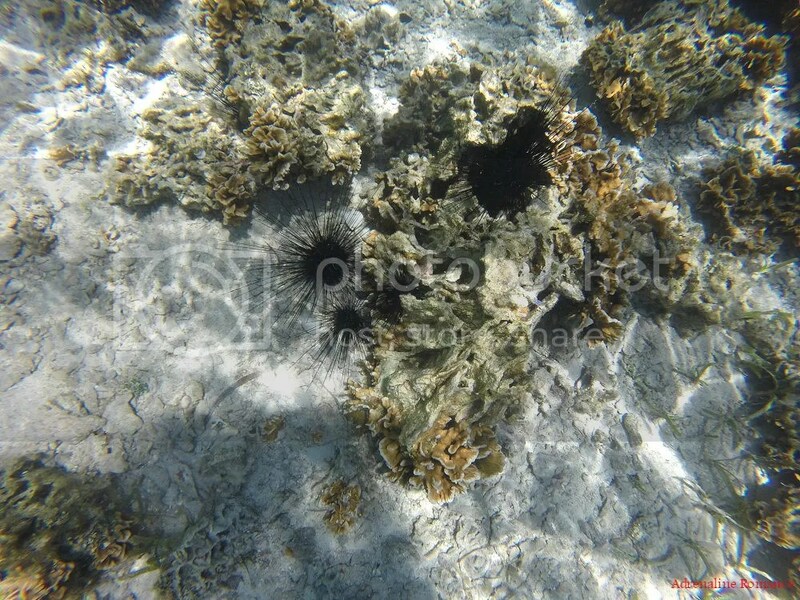 We found several spiky crown of thorns starfish crawling around the reef. 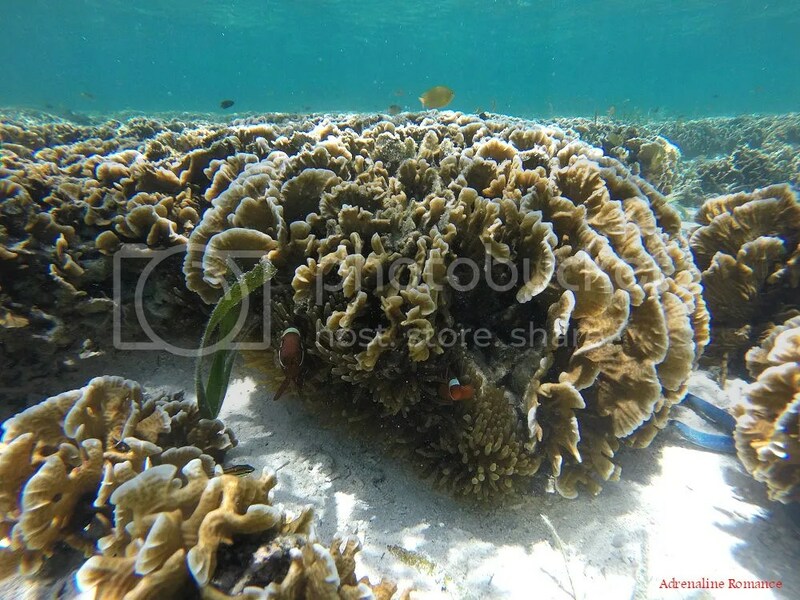 This species feed on corals. An unchecked infestation of crowns of thorns can decimate huge sections of a coral reef. We also found the biggest crown-of-thorns we’ve ever seen in our entire adventuring lives! The body of that monster is about the diameter of an inflated full-sized basketball! And that’s still excluding the arms! Those spikes are truly wicked, in fact, more so than those of those black sea urchins! They contain toxins that can cause excruciating pain for several hours. The toxins are also hemolytic, so a victim may experience continuous bleeding. It requires surgery to successfully remove spines that have been embedded in the skin. 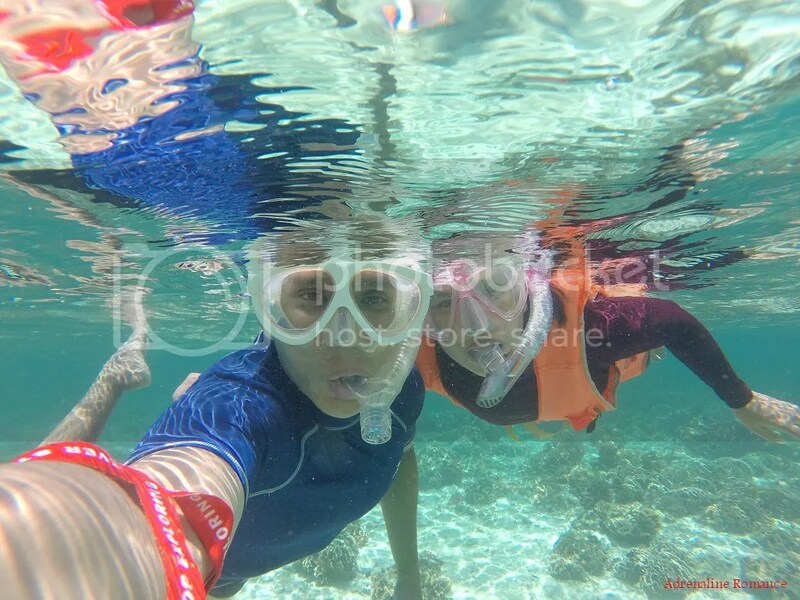 We think you can safely say we thoroughly enjoyed our snorkeling adventure in Gak-ang Island. A little after 1 PM, we were back in Coco Mango, dying for a fresh-water shower. It was searing hot, but we couldn’t resist eating our lunch out in their beautifully manicured garden. Much to our surprise and delight, our accommodations has this really tiny swimming pool! Yes, there is a deep end and a shallow area, just like in bigger pools. The ladies were quite exhausted after an entire morning of island hopping, swimming, and snorkeling. While they took a well-deserved afternoon nap, I took the time to work on a few writing projects. This is what is nice about bringing a compact netbook when traveling. Hehehe! At 5PM, we went to the world-famous Alona Beach to check out the fiery sunset. 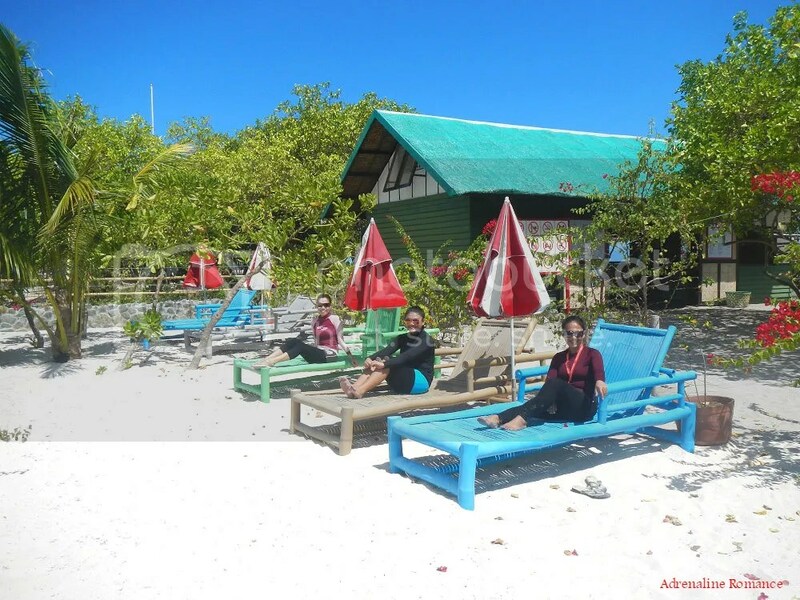 With its white sands, fascinating dive sites, rich coral reefs, and enchanting scenery, it is not surprising why Alona Beach is considered as one of the most famous tourist attractions in Bohol. Lining up the beach are numerous restaurants, hotels, stores, and more. While we understand that this is good for the local economy, we felt that the beach was too commercialized for our taste. 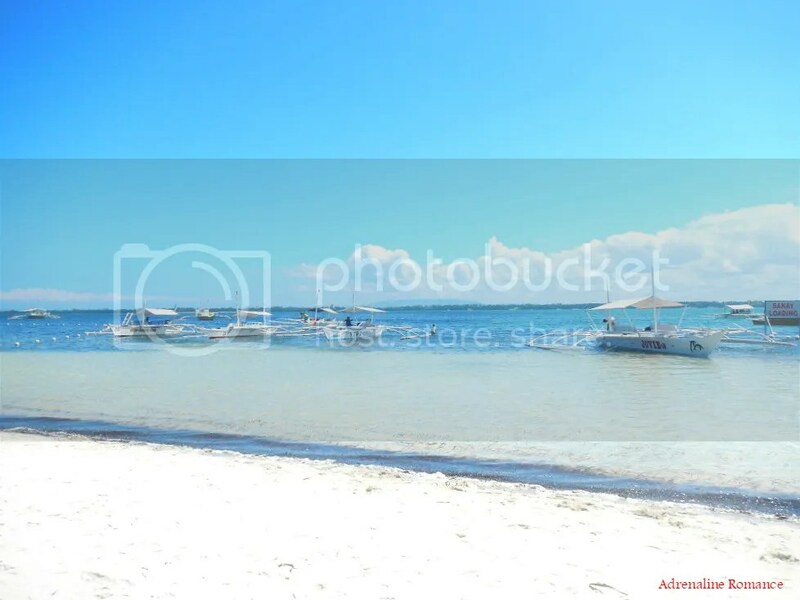 Locals, however, said that there are pockets of less-visited beaches around Alona. 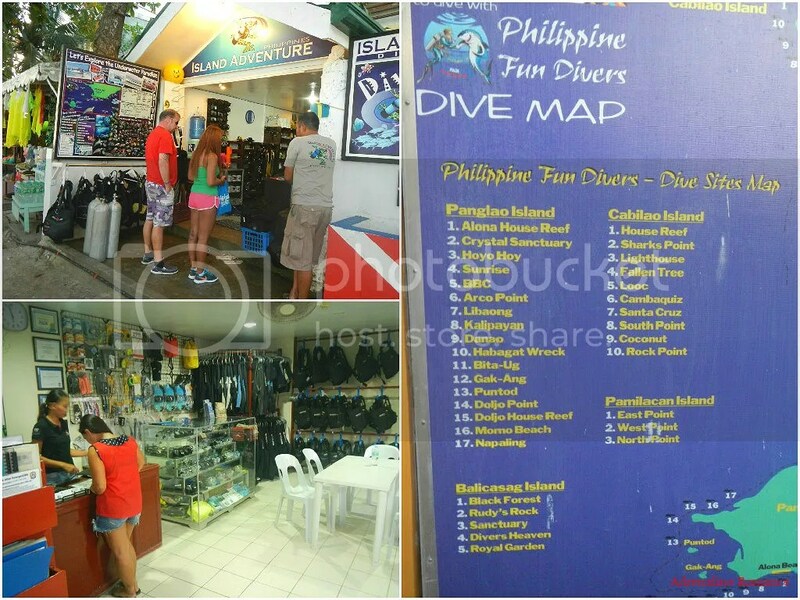 There are also numerous dive centers in Alona Beach; just take your pick. 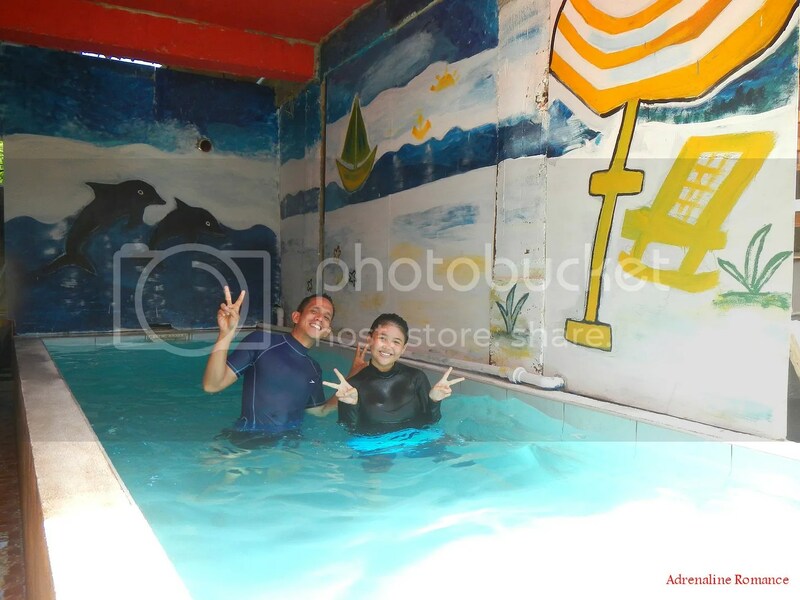 They take divers to the equally numerous dive sites in Bohol, including the underwater kingdom in Balicasag Island. 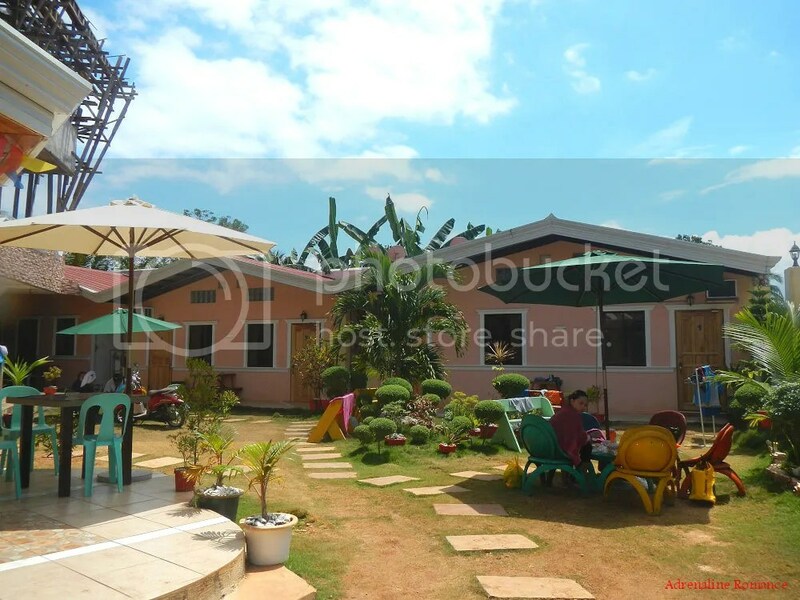 We found the restaurants in Alona Beach a little bit too pricey for our limited budget. 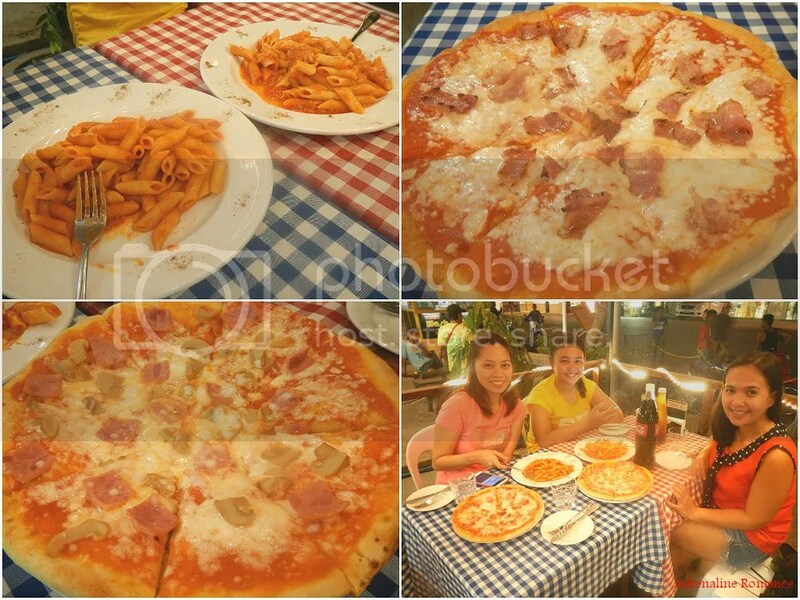 So, we headed out to the town center and found this nice, humble restaurant that serves authentic Italian pizza and pasta at very reasonable prices. They even allowed us to buy a couple of 1.5-liter bottles of Coke at a nearby sari-sari store; that saved us even more money! After having a dessert of organic ice cream (more on that in the next post), it was time to go back to the bed-and-breakfast to get ready for bed. We still have a long day the next day for a tour of Bohol’s countryside. 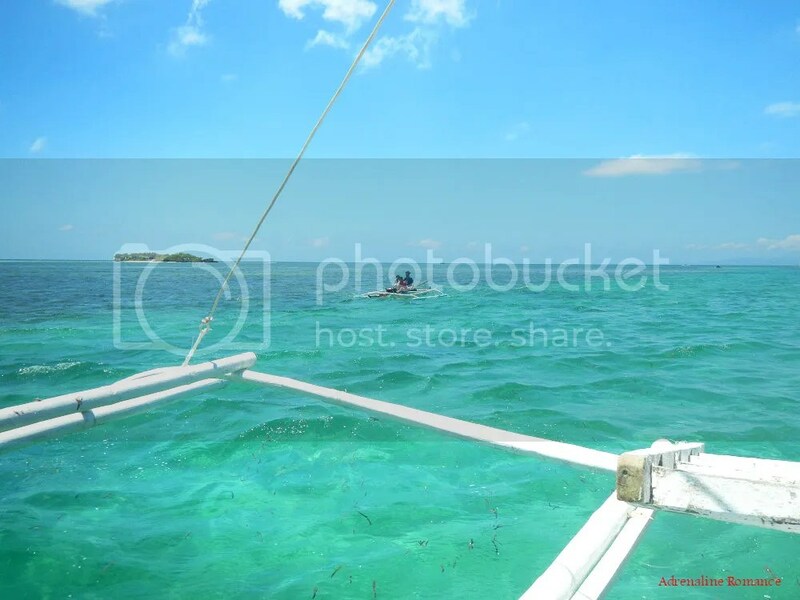 Our island hopping experience in Bohol was thoroughly satisfying, and we enjoyed every bit of it. If a nearby paradise is what you are looking for, then Panglao and the majestic surrounding islands are the perfect places for you. They also took care of our island hopping arrangement. 2. 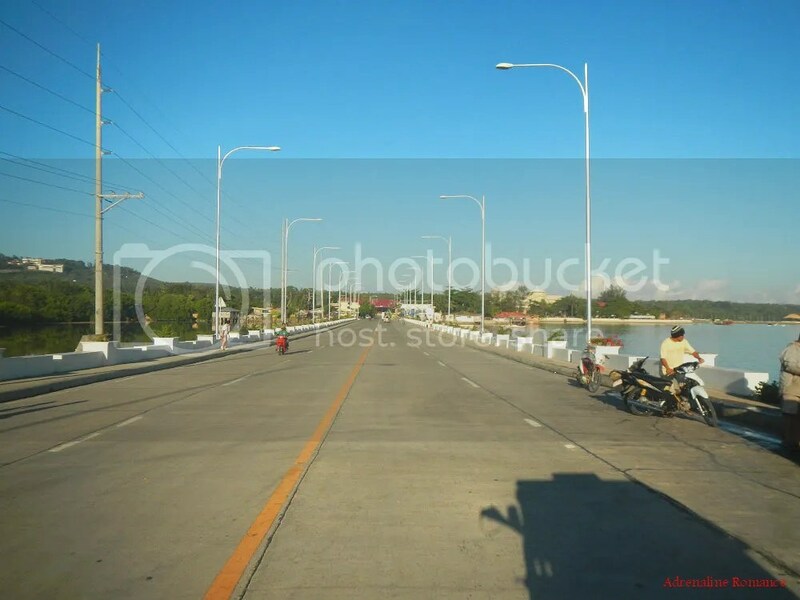 Getting to Panglao (at the intersection just before Alona Beach) from Tagbilaran Port is easy. It takes around 30 minutes to an hour or so to reach Pangao via any of the options below. Option A: This is the easiest, most straightforward, and most reasonably priced option. Negotiate with a tricycle driver in Tagbilaran City to take you directly to Panglao. Fare is usually P200 to P300. This is the option we took. We strongly recommend this move if you don’t want to waste time or if you want to start your island hopping adventure early. Option B: Take a tricycle to Dao Integrated Terminal. From there, wait for a jeepney that goes to Panglao; you can ask assistance from the vendors and locals there. Note, however, that jeepneys to Panglao do not start their journey unless they’re filled to the brim. Unfortunately, they take a long time to fill with passengers; be ready to wait for an hour or two before the vehicle is full and starts its journey to Panglao. The same advice applies on your return trip. Fare is P25 to P30 per person, according to our research. Option C: For utmost comfort, you can hail a taxi to take you to Panglao. Note, however, that taxis are not plentiful in the city. Fare is usually P500 to P600 per person, which is fairly expensive. 3. 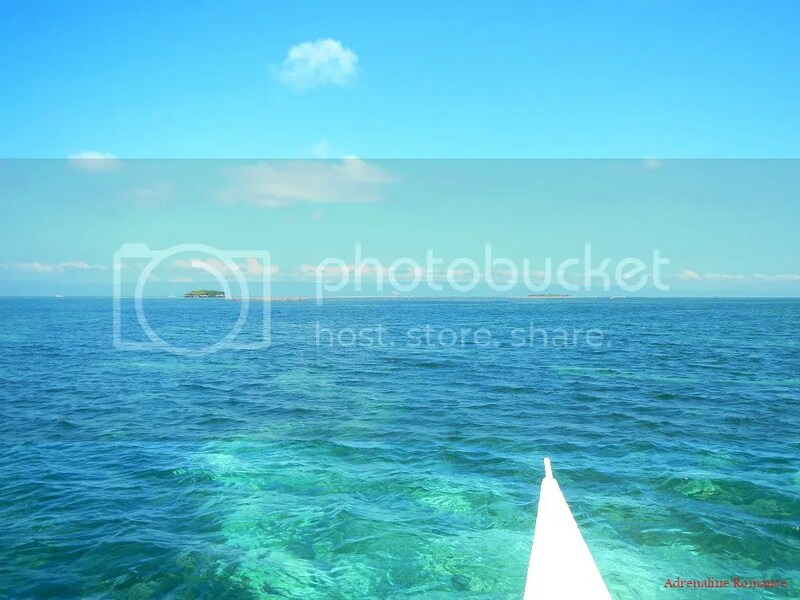 It is best to book your island hopping tour before your actual visit. Ask your accommodation provider in if they can assist you in booking your island hopping tour. 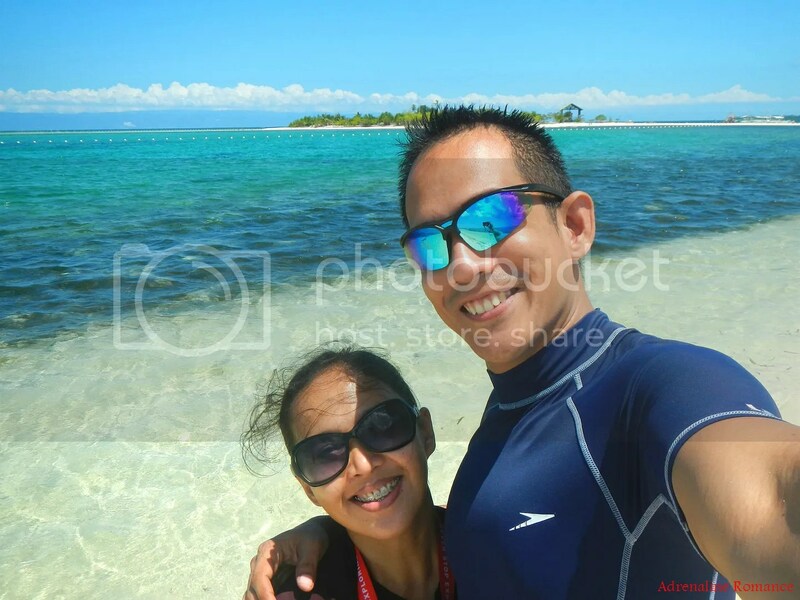 If they can’t or if you were unable to book ahead of time, you can go to Alona Beach or ask assistance from baranggay officials; there are plenty of island hopping operators operating in Panglao. Note that island hopping rates may vary between operators, so we cannot give you an exact amount. According to our research, the rates vary from P1,600 to P2,500 and above depending on the destinations, size of the boat, gear rental, and activities. 4. We recommend starting your island hopping trip in the morning—the earlier, the better. In fact, according to our boatman, if you start your adventure at dawn, you might get the chance to see leaping dolphins! 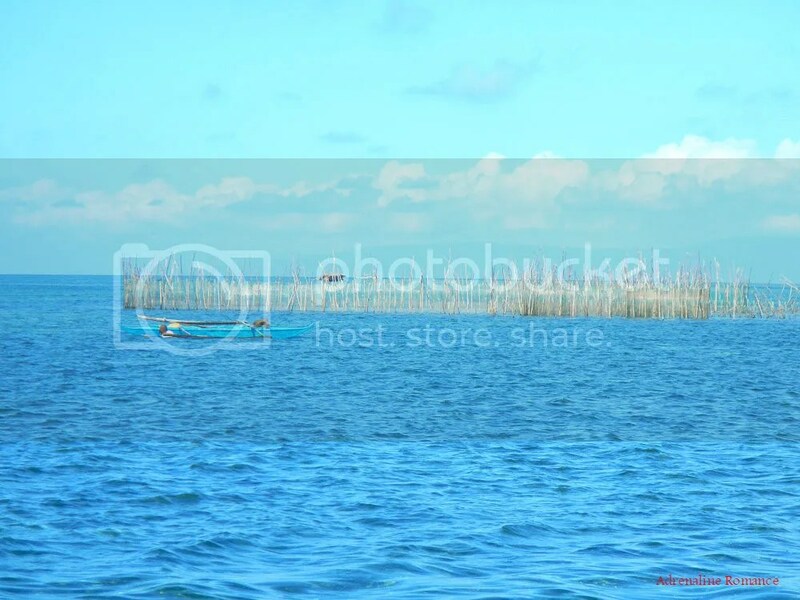 In addition, Panglao’s waters are less choppy in the morning rather than in the afternoon. 5. On a clear, sunny day, the sand in many of the islands can reflect much of the sunlight back into your eyes. Always wear good-quality, UV-filtering sunglasses to protect your eyes. 6. 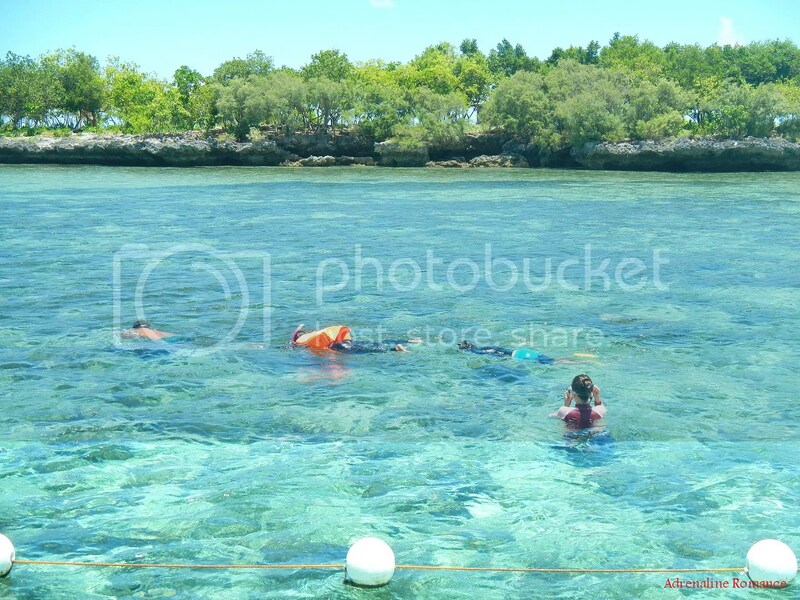 When snorkeling in Gak-ang Island, never step on the corals. They are fragile and can take many years to regrow. 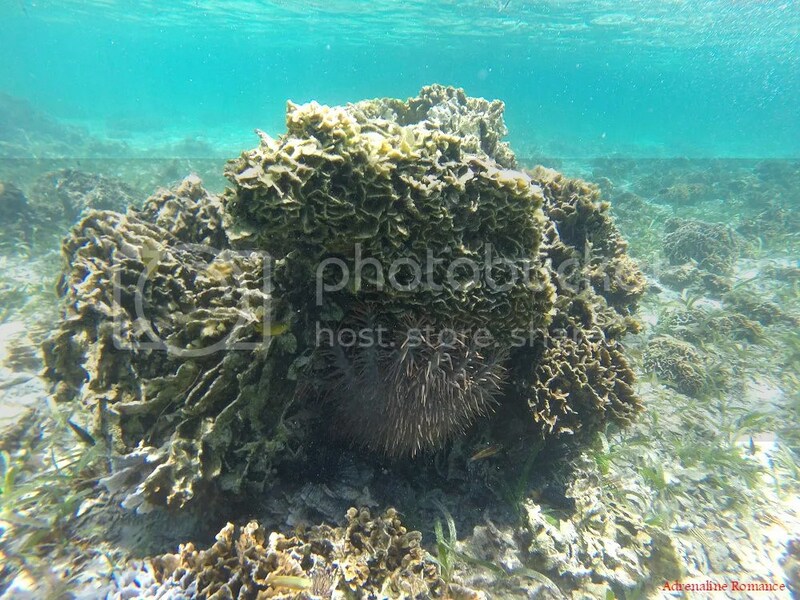 In addition, there are many urchins, stinging anemones, and other creatures of the sea that are poisonous. Stepping on one may trigger a defensive reaction, which can be very unpleasant (and sometimes lethal) on the snorkeler’s part. Thus, always wear a life vest and stay on the water’s surface. If you know how to swim, hover above the corals. If you need to put your feet on the ground, find a sandy patch before putting down your feet. We strongly recommend wearing protective foot gear such as aqua shoes. 7. Except in pens, avoid feeding the fish. 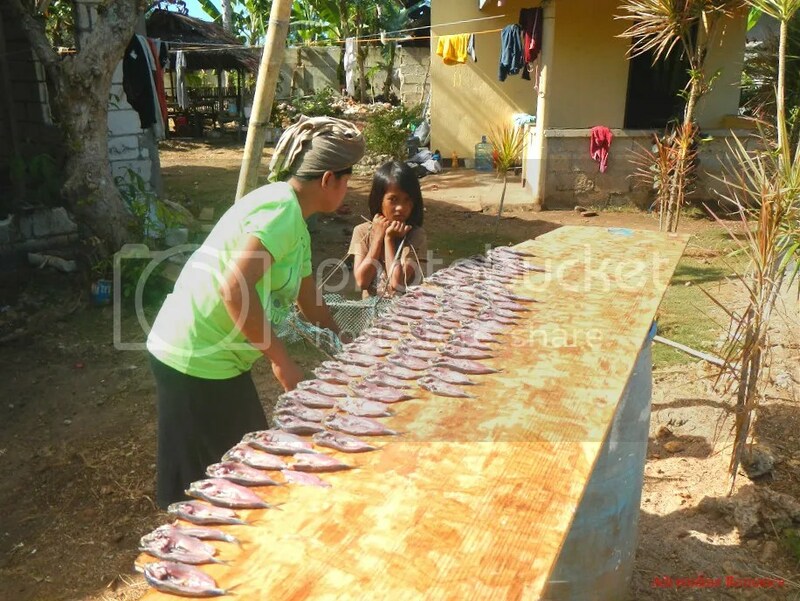 Fish feeding activities disrupt their natural hunting patterns and makes them dependent on humans to give them food. 9. Remember to Leave No Trace of your visit. Do not litter, and do not disturb wildlife. 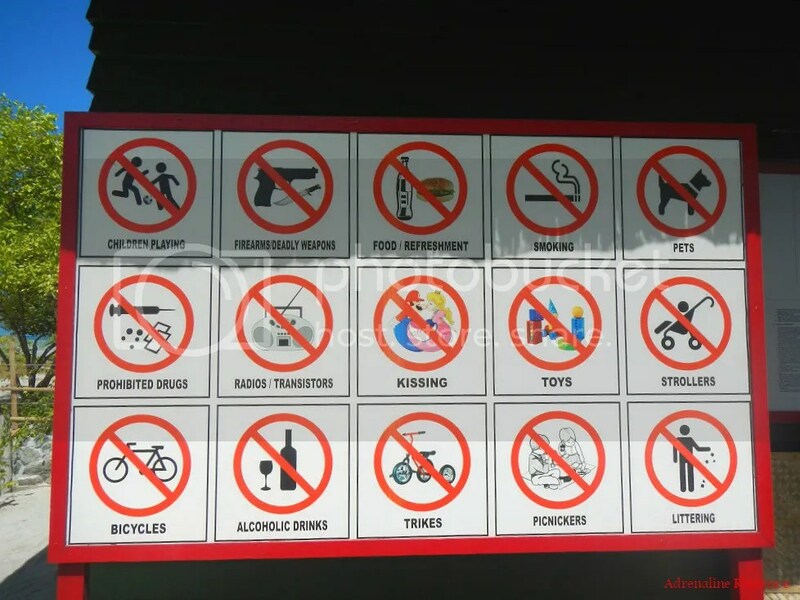 Do not take any rock, plant, sand, that belongs to these paradises. I don’t remember Virgin Island this way in 2013 as only the sandbar was accessible to the public. Turns out they were probably building back then. 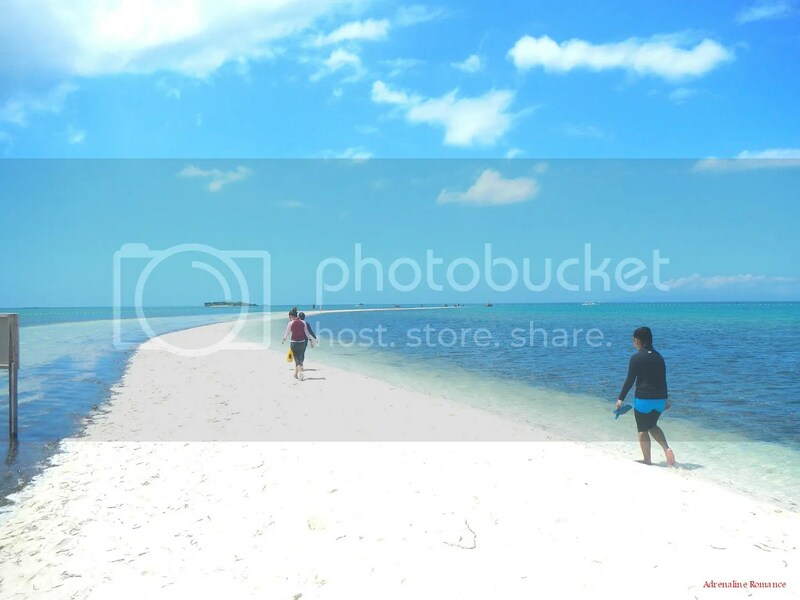 Where is this Gak-ang Island? Is this near Balicasag? And I think Alona Beach is too commercialized and congested. My favorite beach spot is in barangay Bolod’s White Beach, less congestion, better beach than Alona(fine grain white sand). 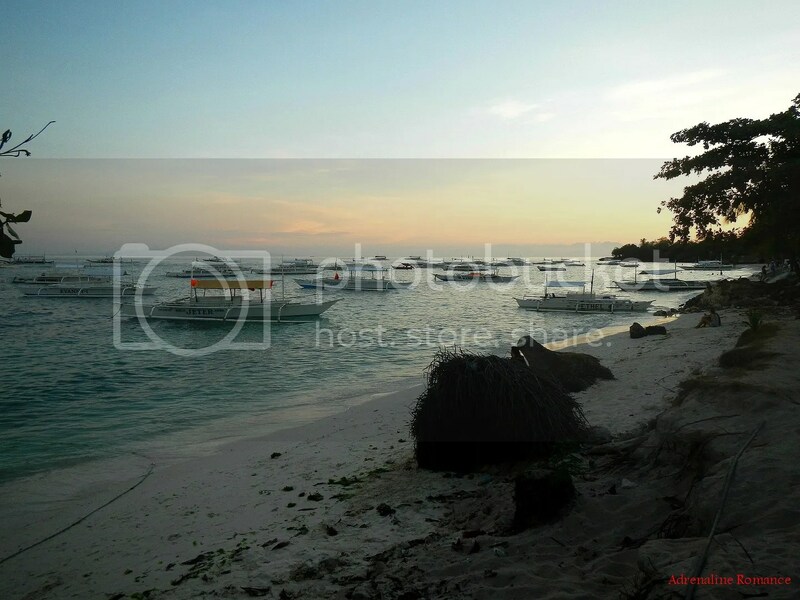 Pamilacan Island can also be seen from White Beach. The island is officially renamed as Isola di Francesco as it is now privately owned. 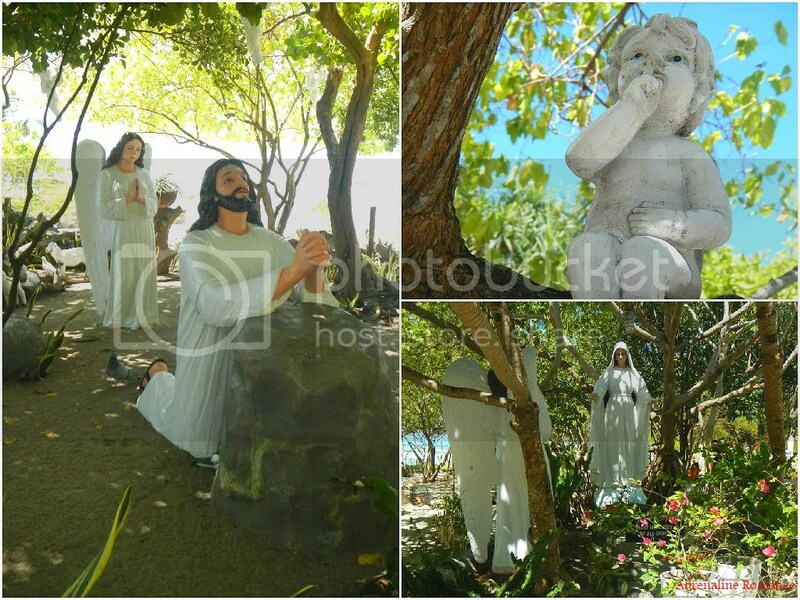 By the looks of it, the Francescans want it to be a haven for reflection and prayer. For now, the entrance fee is free; but we don’t know if it will stay this way as it becomes more popular. All segments of the island are accessible. Gak-ang Island is just a 15-minute boat ride from Isola di Francesco. It is a bit far from Balicasag. Hmmm, we’ll check out Bolod Beach next time. We’ll also find time to explore the dive sites around Pamilacan Island. Our country is just so lovely. Thanks for sharing your lovely photos. Indeed, the Philippines is beautiful! There’s more to our country than all the bad news we hear in the media. It’s really nice there. 🙂 Great for reflection and relaxation. I agree about giving your sweet daughter Alexa a very momerobale gift. 🙂 Panglao is beautiful. When there’s a seat from arlines, there are times when I would want to book a flight to Tagbilaran,but at that time, I was still undecided where to explore. 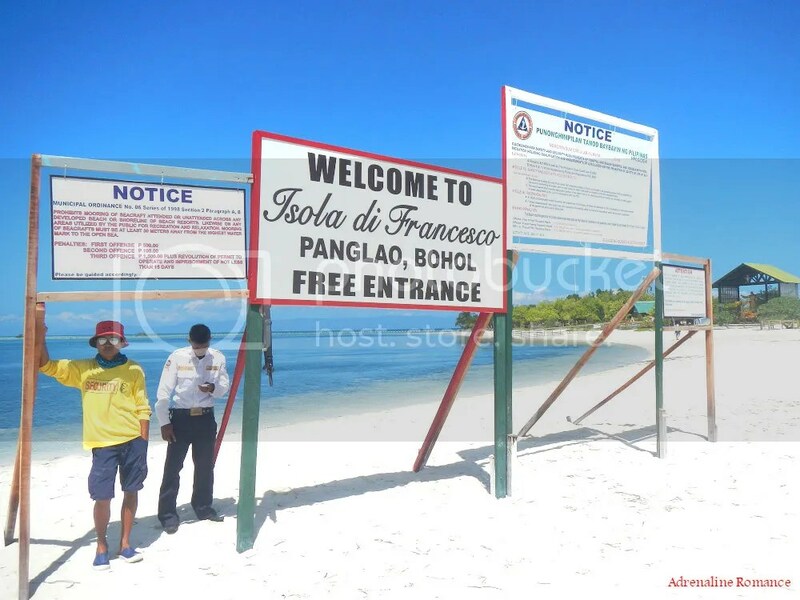 Now, after reading your post (yes I read it all), I know I have to go to Panglao, especially Isola di Francesco. Wow just Wow! Thank you very much for visiting our blog. Yes, we believe that experience is way better than material things, and we want to instill that notion to her. Wow, this is a really comprehensive post! Hats off to you! I’ve been only to Panglao once, and it was for work so I didn’t get to fully enjoy it. We did go to Virgin Island though, and it was already privately owned then. Thank you very much. 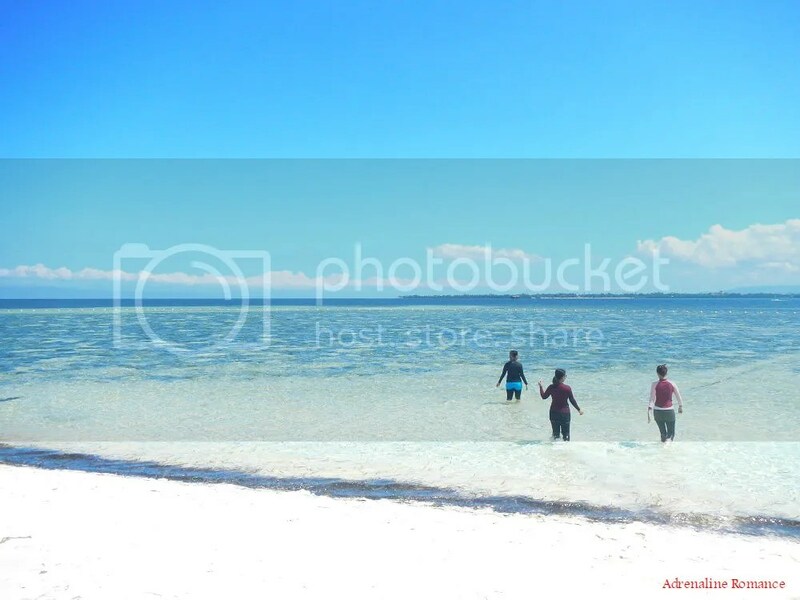 Panglao is a nice place and full of wonders, but you need to spend a day to explore it. The island has caves, hills, beaches, dive sites, and more. 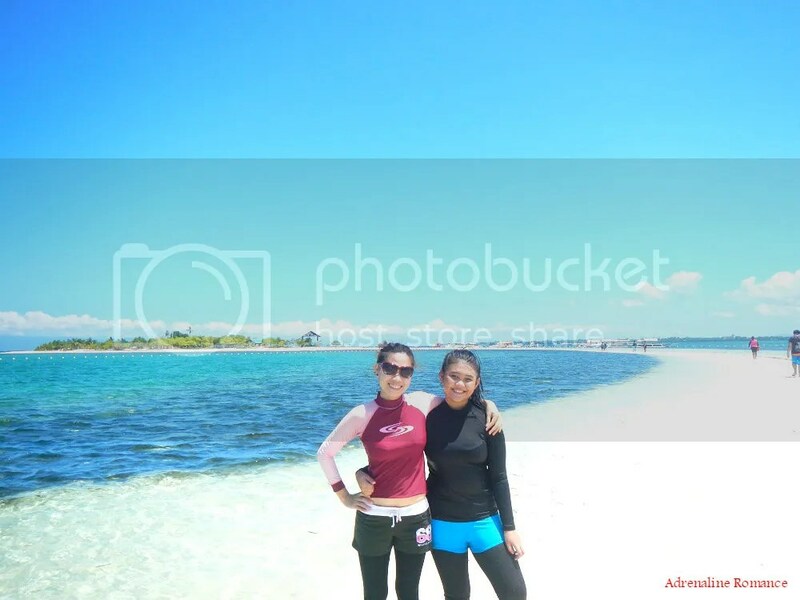 Of course, it has surrounding islets for you to explore. 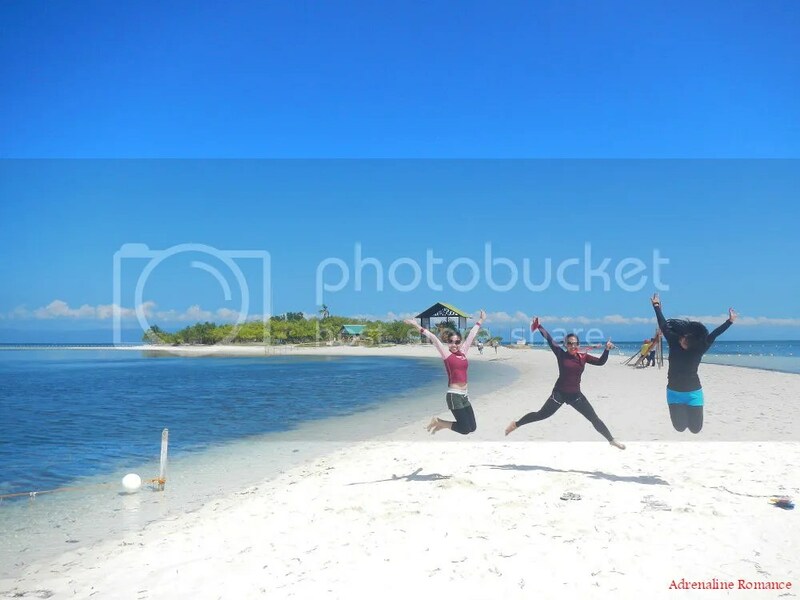 Please do visit Panglao again—this time for leisure. Hehehe! I was in Bohol about a week ago and failed to do the Island Hopping thing due to the very bad weather that time. Excited pa naman ako mag Balicasag and Pamilacan. No, it’s not far. Probably a 15- to 20-minute boat ride. They destoryed that Islands essense and natural beauty by buidling an amusement park. Isola de Francesco is not an amusement park. It’s a pilgrimage site. 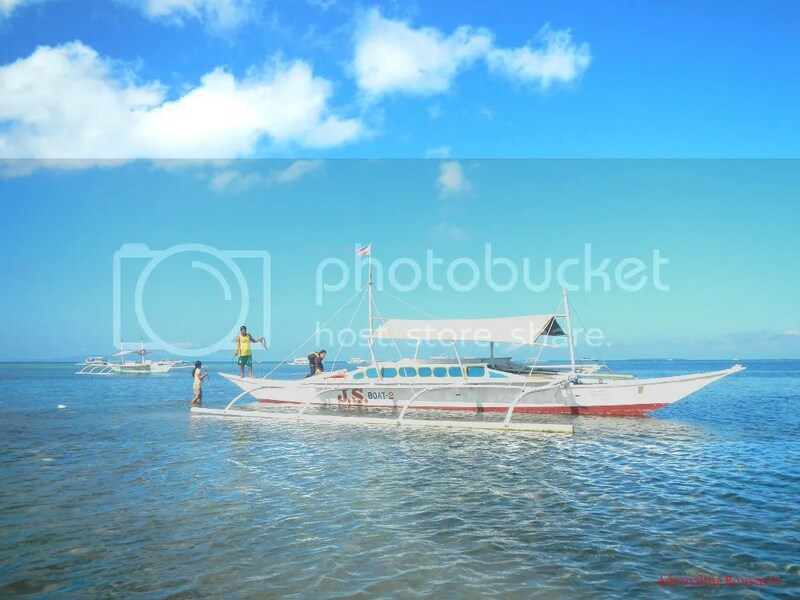 There are plenty of operators in Panglao for your island hopping tour. The accommodation facility you’re booked in will get you in touch or book you with their trusted operators. We stayed at the Coco Mango’s Place, and they booked our boatman for us.